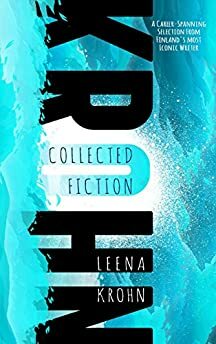 Largehearted Boy: Book Notes - Leena Krohn "Collected Fiction"
Book Notes - Leena Krohn "Collected Fiction"
Leena Krohn: Collected Fiction collects the celebrated Finnish writer's novels, novellas, and short fiction in an impressive collection of speculative fiction. "An extraordinary writer who deserves to be better known to readers in English―which, thanks to this excellent collection, is now possible. Reminiscent of Calvino, Borges, and Lem." The great Finnish composer Jean Sibelius once played a recording of one of his own pieces for a guest. After listening to the recording, the guest asked, "But what does it mean?" Sibelius' only response was to play the recording again without saying a word. Music and literature have shared roots. Listening to music and reading a book both take time. Both are languages that one must learn to understand. "I read your short story collection, and no offence, but I didn't understand it at all. Would it be at all possible for you to analyze at least one the stories and tell me about its background and maybe why you wrote it? What is it really about? —-This probably won't make you feel any better, but no one in our research group (of over thirty people) could find any clear message in your collection. We just had to conclude that it's quite an achievement to write something so opaque." I tried to explain to the writer of this message my view that the experience provided by art cannot be translated into information: "A poem, a novel, or a short story collection is not a text message. There is no single clear message. If there was, there would have been no need to write it in the first place. There are as many messages as there are sentences and spaces between the lines." When I was writing Doña Quixote and Other Citizens, I listened intensively to Shakespeare's songs as performed by Alfred Deller's group Deller Consort. Something of the timelessness, melancholy, and merriment of those songs found its way into Doña Quixote's city and its citizens. Mozart's The Magic Flute has always been a great source of joy for me, and it was precisely this piece of music that inspired the pelican from In Human Clothing to fall in love with the human world and want to become human. Schubert's Winterreise is also a piece that time and again amazes and humbles me. The depth of its feeling, in which passion, hope, and resignation mingle, echoes in many of Umbra's chapters. However, of Schubert's Lieder, Auf dem Wasser zu singen is the one I love the most. Humans understand our own transience, and for that very reason, we are able to escape it. The memory of this song also comforted Emma Eckstein, Sigmund Freud's hapless student and patient, in my play Siebenbrunnengasse 15. Myself escape from changing time.